If you have experienced chest pain, you have probably considered heart problems such as a heart attack. While chest pains may signal cardiac issues, there may be other causes unrelated to your heart. Chest pain that occurs suddenly and is sharp or severe or causes a tight, crushing feeling should be evaluated in the emergency department of the closest hospital. Chest pain that occurs occasionally or is dull and is accompanied by other symptoms, like weight loss, should be discussed with your physician. Although symptoms may be vague, the Mayo Clinic states that generally symptoms of heart attack are found to be similar in most patients. A severe crushing pain that radiates from the chest toward your back, neck, jaw, shoulders and arms, especially your left arm, could indicate a heart attack. This type of pain is often described as a feeling of pressure, fullness or tightness in the chest area. Heart attacks may also cause shortness of breath, sweating or dizziness. These symptoms may persist or come and go and may vary in intensity. Other problems may also cause chest pain. These problems may also cause other types of symptoms including weight loss. Gastroesophageal reflux disease, GERD, causes a painful, burning sensation in the chest. This discomfort often leads to decreased appetite or avoidance of foods that cause distress. These two side effects may cause a loss of weight. Stomach ulcers or gastritis can cause similar symptoms and may significantly decrease the amount of calories taken in. Anxiety or severe worry and stress can cause feelings of chest pain. This psychological problem can also contribute to decreased weight from decreased intake of meals. When in doubt, it is always safest to have chest pain evaluated. If the symptoms of your chest pain are severe and similar to those related to heart attack symptoms, particularly if you have a family history of heart problems or have been diagnosed with high blood pressure, high cholesterol or are obese, you should be evaluated immediately. 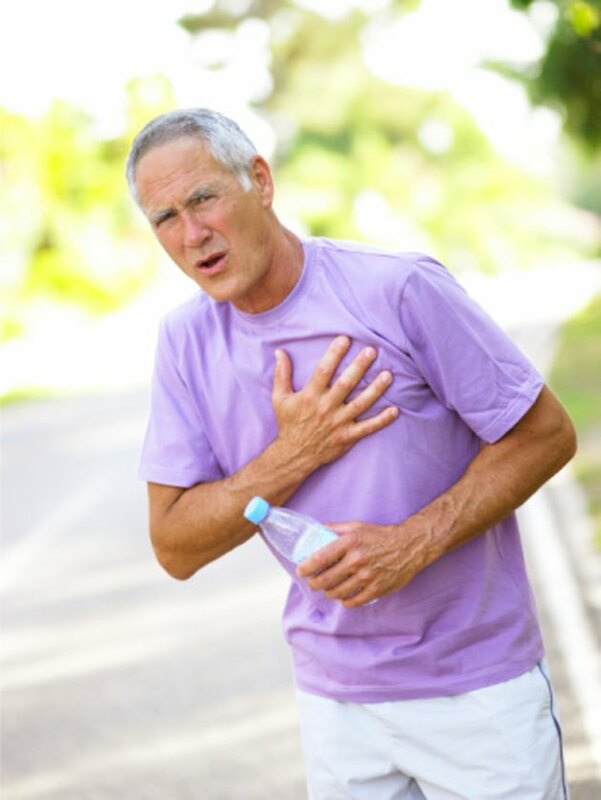 Other types of chest pain associated with non-cardiac related problems also warrant a call to your doctor. When a pain or discomfort is severe enough to cause weight loss, treatment should be considered. Medications are available to treat many of the ailments or your doctor may have suggestions to prevent further weight loss while treating the pain. Obesity or being overweight is a leading cause of heart disease. According to the American Heart Association, maintaining weight in the healthy will improve blood circulation, properly maintain the body's fluid levels and decrease your risk of chronic diseases like diabetes and certain cancers. Losing weight to reach this ideal range can prevent heart disease and chest pain. Losing excess weight can also decrease chest discomfort caused by GERD as well. Healthy lifestyle choices are the best way to achieve and maintain a healthy weight and decrease the risk of chest pain from several common causes. The National Institutes of Health recommends eating a low fat, low-cholesterol diet abundant in fruits and vegetables. Exercising for 30 minutes per day will help to control weight and reduce stress, another cause of chest pain.